Scrapping with Liz: QR Codes: I think I'm in Love! 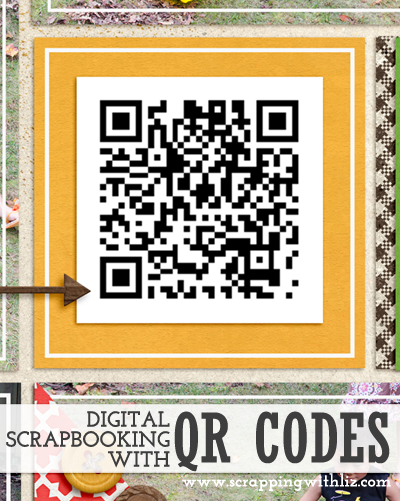 I've been seeing QR codes on digital scrapbook pages for a while. As with most new things it takes me a while to try them. I wonder if they are really worth the time, if they are going to last...basically I just make excuses for not learning new things. 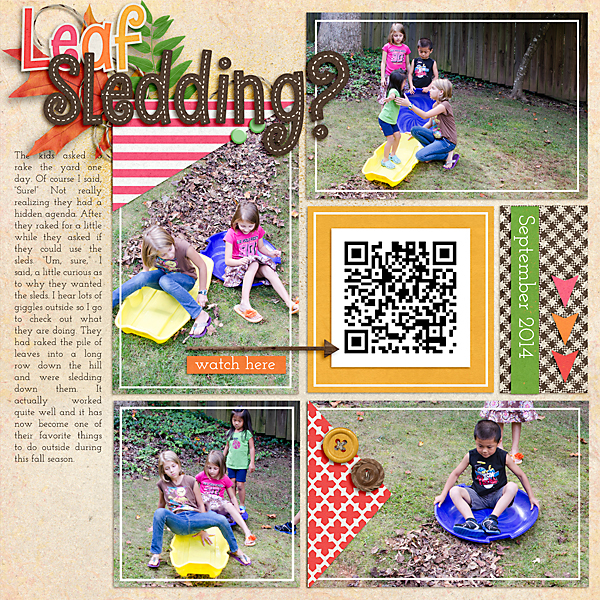 After taking an instagram video of my kids sledding down a pile of leaves and also taking photos of the very same event, I decided to take the plunge and learn how to do this QR scrapbooking thing. I thought the video needed to be remembered with the photos. Do you want to know how long it took me to make a QR code? Like 30 seconds! Why, have I not tried this sooner? The first thing I did was upload my video to YouTube. I made my video 'unlisted' so the only way people could view it was with a direct link or the Qr code. Then I took that link and used QRStuff to generate a QR code. Then I downloaded the QR code and added it to my scrapbook page. Seriously, it was THAT easy. I seriously am in love. I can see my kids browsing through our family scrapbooks with a phone in hand scanning the QR codes to watch the videos that go along with the pictures. This is revolutionary....I'm kicking myself for not trying it sooner. So, if you haven't tried it yet you really should. It takes all of 30 seconds....well, and the time it takes your video to upload to YouTube or other video sharing site you want to use. If you need more tips the Daily Digi has a bunch of good tips and tutorials.